In Hong Kong only a handful of restaurants serve authentic speciality dishes. Chef Kelvin Wong, the sous chef of Town Restaurant at the Fullerton Hotel Singapore, has created a menu inspired by the city's hawker stalls, now on offer at Hong Kong's three Satay Inns in City Garden Hotel, Royal Pacific Hotel and Towers, and Hong Kong Gold Coast Hotel. 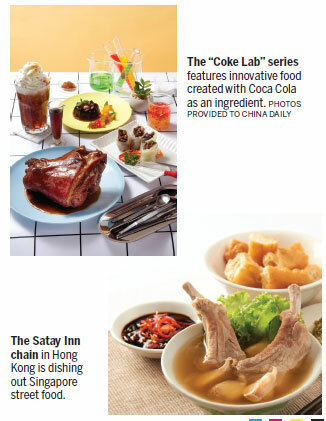 His "Best of Singapore" special menu is available until Aug 9, the National Day of Singapore. "The food journey staged at Satay Inn should whet the appetite of any guest who is contemplating a truly Singaporean meal," says chef Kelvin. Highlights include kurobuta pork rib bak kut teh, crispy pork rolled bean curd loh bak, and mackerel fish otak otak. Of course, there is also the much-praised baked sambal stingray fish, coaxed into memorable bites by the chef's special sambal belachan (spicy shrimp paste) dressing. The dessert duo cheng tng (sweet soup with longan, barley, gingko nuts, white snow fungus) and durian bubur terigu (palm sugar and coconut milk) should sign off the experience with sweet memories of the Lion City. Executive chef Zero Yu has expanded on the idea of chicken wings with cola. The variations on the theme created by him will be available at Zero in Langham Place and Made in HK in apm until Sept 30 as part of the "Coke Lab" series. Top of the list is Coke chlorophyll - refreshing cabbage rolls stuffed with morsels of Coke-braised pork belly and mushrooms. The dish comes with a dip, combining Coke with garlic-chilli. Equally memorable is Yu's most elegant dessert, Liquid Crystal Coke - a transparent raindrop cake made with Coca-Cola that is as delightful to the eyes as it is to the palate. Embellished by a memorable garnish of edible flowers with pineapple sauce and honeycomb, it is a real pleasure for the senses. Little wonder that the chef had a restaurant named after him (Zero, Langham Place, Mong Kok, Kowloon). Rounding out the list is the Dragon Noodles Academy (DNA) at Man Yee Arcade, Man Yee Building, 68 Des Voeux Road, Central. The restaurant is offering a "Nostalgic Guangzhou" menu until Aug 31 as a tribute to kung fu icon Bruce Lee. This features traditional dim sum dishes created by the restaurant's executive chef Winson Yip and savory delicacies by his deputy, K. C. Mak. Highlights at DNA include steamed siu mai pork dumplings with quail egg, and steamed siu mai pork dumplings with pork liver, one of Bruce Lee's favorite foods. Also on offer are some really rare delicacies such as a de-boned eight-treasure duck stuffed with lily bulbs, salted egg yolk, coix seed, quinoa, lotus seed, shiitake mushroom, chestnut and conpoy (advance order is required for this dish). Mak says, "Anyone who has lived in Hong Kong for more than 30 years will tell you about the amazing delicacies served in celebratory banquets. Our culinary team would like to bring back those vivid emotional memories to our diners." I say - bring them on, please!